A budget - Music to my ears! Knowing what you spend each month is vitally important if you want to do any sort of financial planning. How can you save if you don't know what you spend? 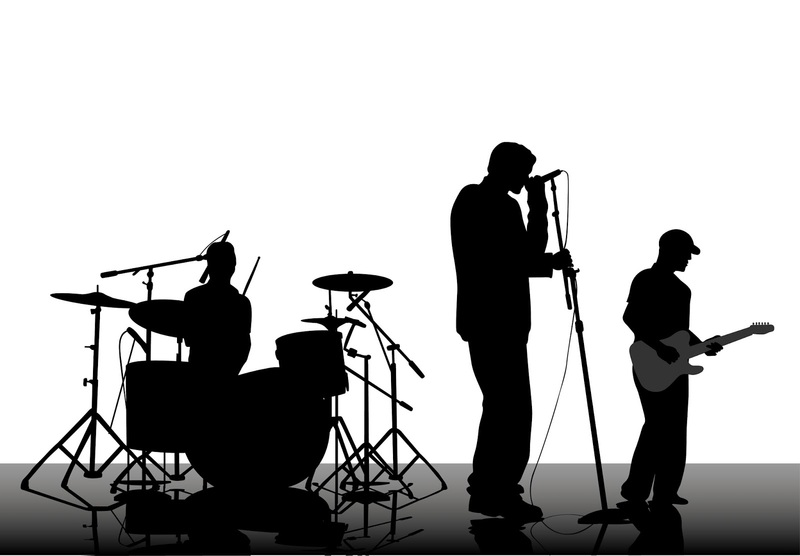 A budget is the Bassist in your Financial Plan Band1 - it links the rhythm of the drums (Income) to the harmony of the Guitar (Expenses) and allows you to make Music (Generate Wealth). In this post I discuss how to draw up a budget and give you a template to download which you can use as a starting point. Rock On! You may be wondering why you even need a budget. Well, whether your plan is simply to save for your next holiday, or something bigger like early retirement or financial freedom, your starting point is always your budget. You need to know your expenses so you can determine how much you can afford to put away towards your goal. This makes the planning so much easier, and allows you to calculate if the goals you have set are achievable and how quickly you can get there. I find budgets useful for another reason - it allows you to reduce and sometimes eliminate expenses which you have either forgotten about, or allowed to get out of hand (that magazine subscription that you no longer read, or that gym contract which you keep promising to use). So it is very handy for trimming the fat. Also once you have a budget drawn up, you can start playing with the numbers. What would happen if you stopped that DSTV subscription? How much can I invest once the car is paid off? 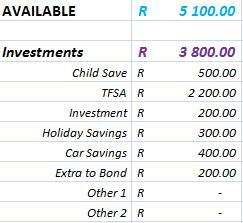 So a budget is great to see the effect that certain sacrifices and achieving certain goals can have on your finances. So how do you draw up a budget? What I find to be the easiest method is to open your latest bank statement. From this you will be able to see all the money coming in (lekker lekker) as well as all the money leaving your bank account (oh no!). Of course you must not forget about your credit cards and store accounts if you make use of these (store accounts please please please no, and credit card only if you use it in such a way that you never end up paying interest). So go ahead and get your lastest bank statement, credit card and any other relevant statements. The next thing you need to do is examine all the money leaving your account. You also need to combine same/similar expenses into a monthly total - for example you may have put petrol into your car 3 times, so add these up for a total petrol amount. Once you are done you should have a long lengthy list of items such as Rent, Insurance, Groceries, Cellphone, Electricity, Bank Fees, Petrol, Medical Aid, Internet etc. The next thing I like to do is to split the expenses into "Fixed" and "Optional". Now this might be a little subjective, but I define the Fixed Expenses as those expenses which are essential for your day to day life. Expenses such as Rent/Bond Repayment (you need somewhere to live), Car Repayment (repossession is never really any fun) and Groceries (meat's meat and a man's gotta eat). The optional expenses are things which you could live without, like Entertainment (Party On! ), DSTV (contrary to popular belief you really can live without it) and Insurance (be careful with this one, some insurance you can do without, some you should view as a must). Next total up the Fixed and Optional Expenses subtotals into a Total Expenses value. 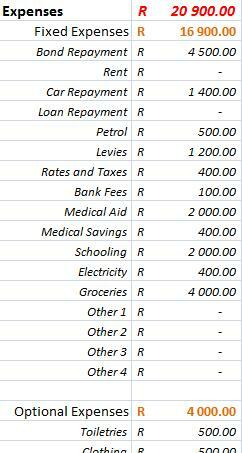 And the final calculation - the remaining funds at the end of the month. The remaining funds is calculated as the Available value less the total of all the investments (in our example R5 100 - R3 800 = R1 300). Some people will have funds left over, others will not. If the funds left over is negative you have problems ahead and you need to address this as soon as possible! I will do a post on cutting costs in the near future and hopefully that will assist you on getting your budget back on track. So now you have drawn up a budget based on your past bank and credit card statements. This is all well and good for seeing how you have done in the past, but what we really need to do is plan better for the future. So the next step is to take your budget and make a copy of it. Add the month and current year to the top (for example July 2016). This will now be your plan for your finances for the next month. It does need a few adjustments though. Remember to add this sub-total to your Fixed and Optional Expenses to get your Expenses grand total. 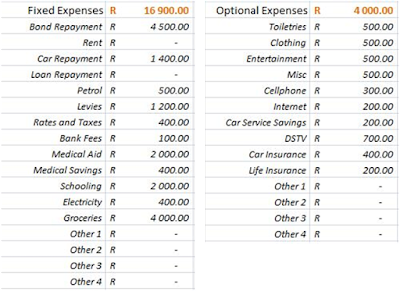 For our example, the total expenses for the next month is the Fixed Expenses (R16 900) + Optional Expenses (R4 000) + Unique Expenses (R200) = Total Expenses (R21 100). After adding these expenses, make sure that the remaining funds is always positive. If the remaining funds goes negative as a result of some additional Unique Expenses you are going to have to cut somewhere else to make up the shortfall - maybe less eating out that month, or a pause on the holiday savings and delay your trip for a little longer? In this way you can plan ahead and make sure you never run into a shortfall. To make things easier for you and get you up and running, I have made a Budget Template available for download which you can fill in for yourself. Feel free to distribute it to anyone else who you feel could benefit. Or why not tell your tweeps about it by clicking the button below? Here are some of my thoughts and tips on budgets. I like to make sure that there is always between R500 and R1 000 left over at the end of each month (after all expenses and regular investments). This is because sometimes something unforeseen happens, and our good friend Murphy says this will always happen towards the end of the month when you have 0 in your bank account. Then you have to use the credit card or borrow money - both of which I hate doing. So don't invest/spend every last cent, always try leave a little wriggle room. If you have a negative Available value it means that your expenses are more than your income (and this before any savings/investments can be made). This is not the end of the world, and it can be fixed, but you have to act immediately! The good news is you have all your expenses in front of you now and you should immediately look to cut what you do not need, and reduce what you can. I will visit this topic in more detail soon. Attack your Optional Expenses first. There are some "easy wins" to saving money. For example, check what happens when you eliminate your DSTV, or gym contract. Do you really need cellphone insurance? Your Fixed Expenses are fixed in the sense that they need to be paid every month, but this doesn't mean they can't be reduced. LED globes can reduce your electricity. Do you really need a gold coloured bank card instead of a silver one? Time to revisit your insurance? Do not look at any investment amounts until you have paid off your car, credit card and any store cards. These expenses MUST be eliminated A.S.A.P. They are a massive drain on your finances. Try to smooth out big expenses. For example instead of having a big car service payment every year I prefer save about R200 every month. Then when the service arrives I have enough saved up to not disrupt that month's budget. If you know you have a destination wedding coming up, start putting away some money every month, so by the time the event arrives your monthly budget can just continue as usual. I usually allocate money every month for Car Services, and upcoming holidays. For some expenses which fluctuate monthly, for example electricity, I like to allocate a value that is higher than what the actual value is likely to be. For example if the most that my monthly electricity has been in the past is say R507, then I make the monthly electricity amount R600 in my budget. This way I normally end up with a little extra at the end of the month, or worst case if the electricity is that high then at least I have it covered. If there is any money left over at the end of the month, then you have done well (yay for you!). But that doesn't mean you should be spending it. Instead why not add it to your Investments, or use it to pay off short term debt, or if that's taken care of throw it into your bond. If you currently live your life with no budget, I hope this article has kicked you into gear. Get cracking! Take control of your finances - know where your money is going. Financial planning is so much easier when you are in the know. 1 I am thinking a good name would be "The Net Surplus" or "The Financial Freedoms" or "Warren Buffet and the ETF's"
2 Excel - In my opinion Microsoft's greatest product! Super powerful and useful in just about every scenario.